Striped bass are often called Stripers. In the Chesapeake Bay area Striped Bass are called Rockfish. Striped bass tolerate both salt and fresh water. Striped bass live in the ocean but spawn in fresh water rivers. In the Spring stripers migrate north from deep waters off the Virginia and North Carolina coast to New England waters. In the Fall they migrate back down to the south. Stripers mainly stay in the vicinity of the coastline. Stripers swim fast, but not the fastest, so they don't always chase down prey like blue fish. However, they have large tails and can maneuver well, and they can swim with control in fast moving turbulent waters. Stripers prefer to ambush prey, that are stirred up and disoriented, by turbulent water. Striped bass have a preferred water temperature range of from 55° F to 68° F, and migrate to find water of these temperatures. Stripers are seldom caught if the water temperature is below 44° F.
Striper peak feeding times are the half hour before sunrise and at dusk. Striped bass don't have eyelids. When the sun comes up they will retreat to deeper water to avoid the bright light. Striper fishing is mainly a nighttime activity in the warmer months. Stripers will eat almost anything, but favorites are bunker and clams. Older, large female stripers are called "Cows". Younger, smaller stripers are called schoolies or shorts. Female striped bass grow larger than the males. If you catch a striped bass over 15 pounds it is probably a female, with the potential for producing a million eggs for each 10 pounds of body weight each spring. Don't take her out of circulation. Take a photo and gently release her. Let your photo be your trophy. The World Record striped bass weighed 81 pounds 14 ounces. Freshwater striped bass, and hybrid striped bass, resulting from crossing striped bass with white bass, now inhabit many fresh water lakes. When you catch a striper and measure its length, you can estimate its age using the table below. Note the large variation in length to weight and age. This is most likely due to an individual fish's luck in finding food during its lifetime. Fish scales can reveal the age of a fish in a fashion similar to the rings of a tree. Scales get larger as the fish grows by adding growth circles, called circuli, to the outside edge. When a fish feeds heavily from spring through fall, the scales grow pretty fast with wide spacing between each circulus. Because most fish feed less and grow more slowly during winter, there is less space between each circulus and a thicker ring is formed. 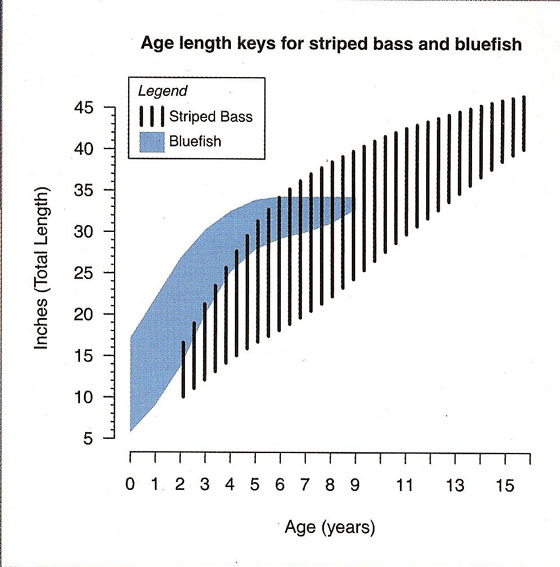 Biologists count these rings to determine the age of the fish, as seen below in this scale from a 10-year old striper. Ten Year Old Striped Bass Fish Scale - Image provided by John Boardman - MA Division of Marine Fisheries. Credits: This item is from the May 2008 issue of On The Water Magazine.